It has been awhile since my last post about a family dinner get-together. 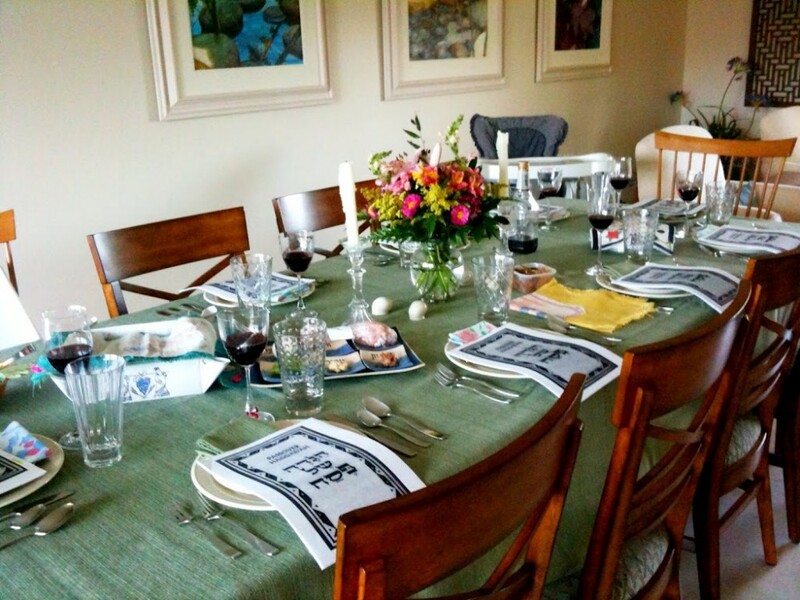 Passover began last weekend, so tradition brought us all together for a seder dinner at my aunt’s. There are specific things you can’t eat during the week of Passover — basically anything made with flour. Despite the fact that this seems to include a lot of foods, we were all completely stuffed after our delicious dinner. Our actual seder seemed to last only about 5 seconds. It’s hard when you have two 2-year-olds at the table. For the first time in a while, I was the one given the job of reading the Four Questions. This is always done by the youngest person at dinner (the youngest person who can read in this case…). My sister, Rebecca, has always been the one to take on this task in the past, but since I am here and she is in NJ, it was up to me. Good thing our Haggadah was in English! After going over the different items on the seder plate, saying the prayer over the wine and reading through the 10 plagues, it was finally time to eat! We started out with some of Bubby’s famous matzo ball soup and a white bean and artichoke salad — a traditional Passover dish for Sephardic Jews (Jews of Spanish or Mediterranean descent). 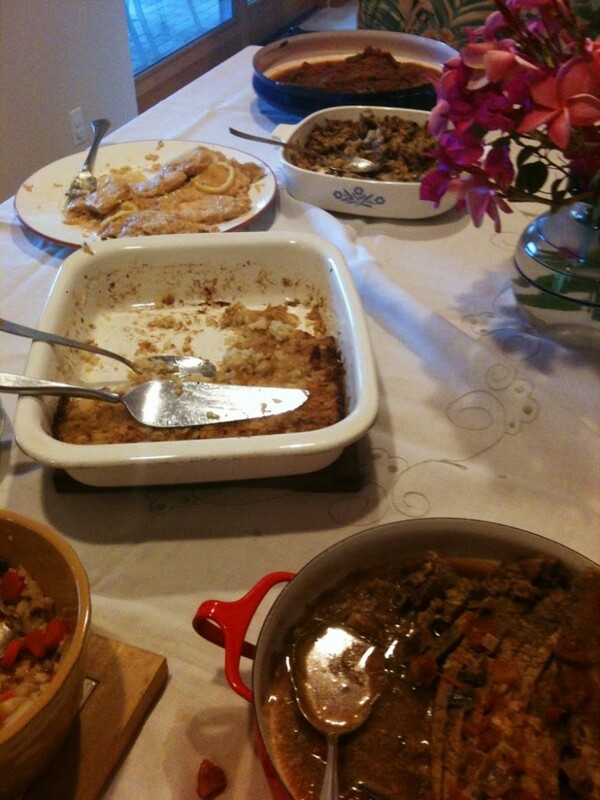 My family is not Sephardic, but my aunt’s friend made the dish for us to enjoy. I could have eaten only this salad for dinner and been happy; it was so good. My aunt will be passing along this recipe for me to try out soon, so stay tuned for that. Chicken and brisket were the main entrees, accompanied by three different kugels: potato, broccoli and one made with matzo. 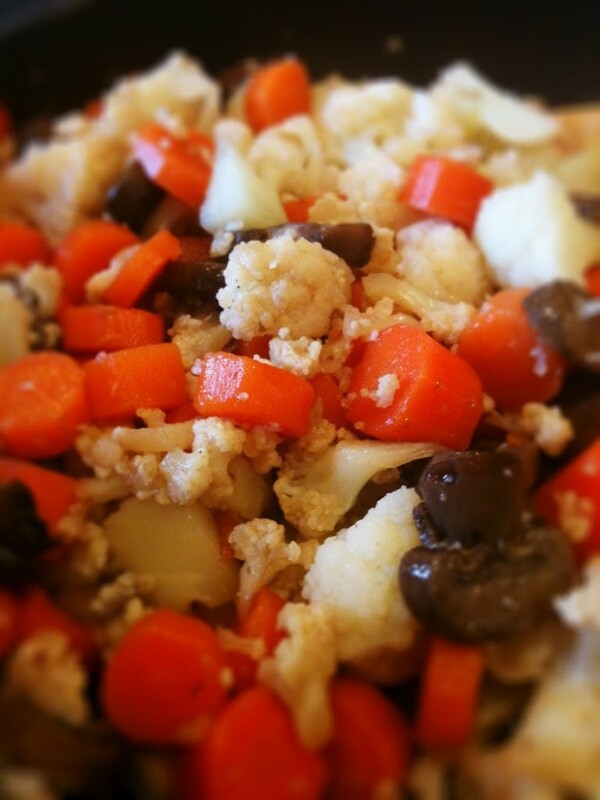 I made a honey soy vegetable dish with carrots, mushrooms and cauliflower (recipe below). As always, everything was delicious. My favorite was definitely the artichoke salad, but I have to say my veggies were pretty good too, even if I have to say so myself! I used all fresh vegetables, but you could use frozen too. I didn’t measure out all the ingredients because I like to add each little by little and taste as I go, until I find the perfect flavor, but I will give estimates. Put all your vegetables together in a large sauce pan and fill with enough water to cover them completely. Cover and heat on a medium flame. The vegetables will steam slowly. Keep an eye on them, constantly feeling them with a wooden spoon; you don’t want them to steam too long or they will become soft and mushy. While your veggies are cooking, make the honey soy glaze in a smaller saucepan. Over a low flame, pour the honey and soy sauce into the pan and mix together. Squeeze the juice from both halves of the lemon into the pan. Stir in the brown sugar and five spice until a sauce starts to form. It won’t be a thick sauce; instead it will have the consistency of a salad dressing or vinaigrette. Once it starts to bubble, turn off the flame so it doesn’t burn. By this time, your veggies should definitely be done cooking. Remove them from the heat and pour the sauce them and mix until they are well-coated. I added a little more honey, soy sauce and five spice to the mix at this stage and continued stirring until I felt there was a generous amount of the sauce covering the vegetables. Originally I was going to make honey-glazed carrots, simply using honey, brown sugar and lemon juice. When I realized I didn’t have enough carrots, I quickly scanned the refrigerator for anything else I could use. The only other vegetables I had on hand were mushrooms and cauliflower. Honey seemed too boring to use all by itself if I was going to use a mix of vegetables, so I grabbed the soy sauce and five spice and changed it up. Its a good thing I was short on carrots or I wouldn’t have had the opportunity to come up with this delicious side dish. It was the perfect amount of sweetness to go with the other more savory dishes we had at dinner. I got a nice little surprise at dinner — my homemade matzo cover! 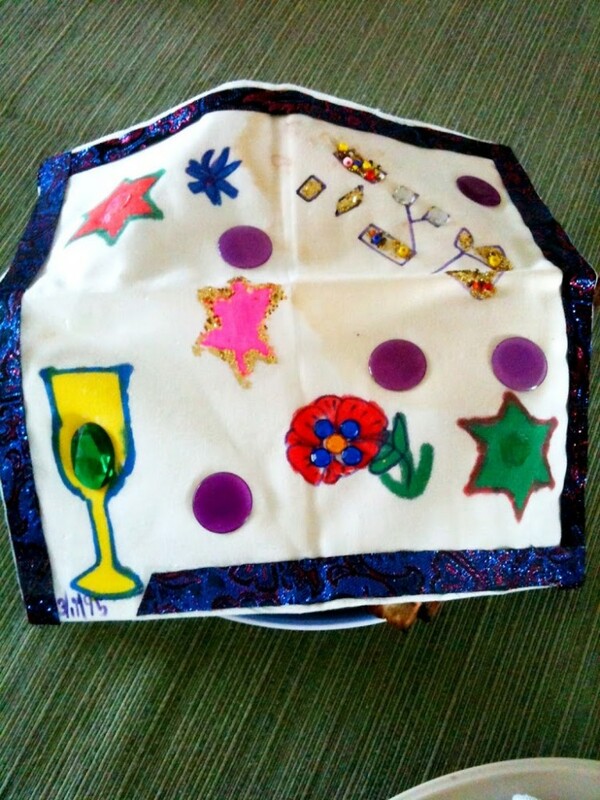 My mom sent my aunt the matzo cover I made in Sunday School when I was 7-years-old. When I sat down at the table, there it was covering a plate of matzo in front of me. I looked at it and wondered who made such a bedazzled, colorful cover and then saw my chicken-scratch writing at the bottom: “Shaina 3/1995” Thanks for the little piece of home, mom! « Go Nuts & Cranberries for Chicken Salad! Wow, you made passover CAKE?! I usually just stick to the matzah (didn’t know you COULD make cake out of the stuff…!). I’ll have to try that next year to liven things up a bit! My cousin made the cake! I will ask her for the recipe and post it. Thee flour less chocolate cake doesn’t use any matzo. But there are recipes for tons of goodies you can enjoy during Passover; one of which is Matzobrei, which I’ll be posting a recipe for today!